This AAC Blackout Flash Hider is an extremely efficient design that effectively eliminates muzzle flash, even on short barrels. The open-end, 3-prong design of the Blackout is inherently stronger than 4-prong units, and is not subject to the wear and erosion commonly encountered with closed-end designs. All Blackout flash suppressors are machined from high strength aerospace steel alloy and coated in a hard, durable, corrosion resistant SCARmor finish. 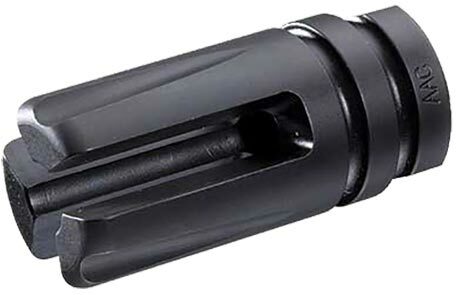 This 90-Tooth Blackout flash hider works in conjunction with AAC's ratchet taper mount silencers, an evolutionary step forward from the original 51-Tooth ratchet mount design. The new 90T gear on the flash hider interfaces with a spring biased ratchet lever on the suppressor to eliminate the potential for the silencer to inadvertently unthread during firing. The flash hider's finer pitch external ACME thread and improved low angle body taper snug it up securely with the correspondingly angled surface inside the silencer, creating a rock solid platform. Not compatible with the older spring mount (18-Tooth) or ratchet mount (51-Tooth) sound suppressors. Length Added to Barrel: 1.875"